Salt to taste when serving. Adding too much salt while cooking will cause the sauce to break down and become thin. 1. Bring beans* and about 2 quarts of water to a boil in a heavy pot or dutch oven. Lower heat and simmer (strong simmer) for 2-3 hours or until beans are soft. Add water to keep level about an inch above beans. Do not drain beans. 2. Add onion, peppers, carrots, garlic, and fresh tomatoes and cook until vegetables are tender, about 30 minutes. 3. Add tamari, corn flour and water mix, crushed tomatoes, and all the spices you want. 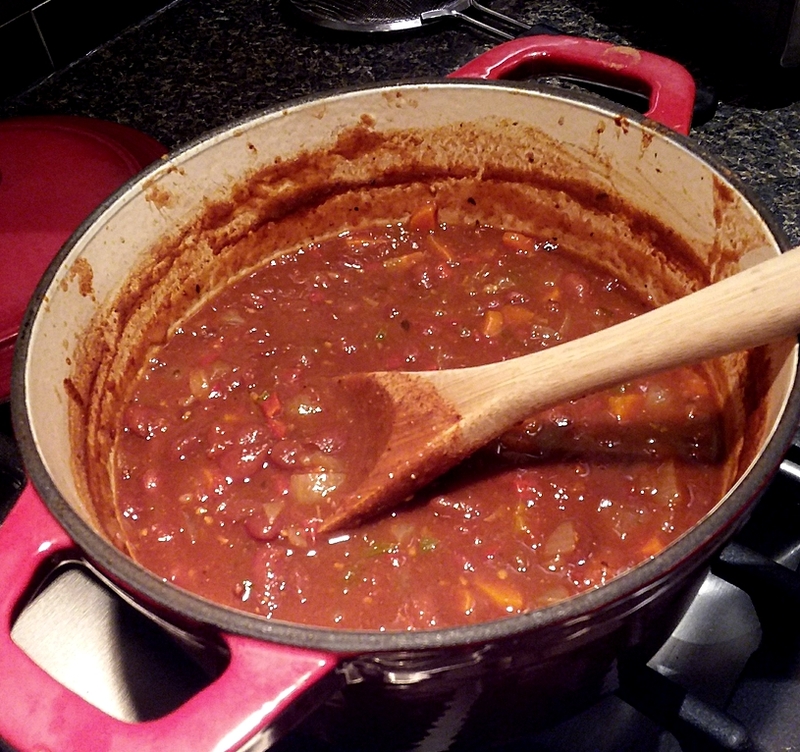 Cook until chili thickens and flavors meld, about 30 minutes. You can cut hours off this recipe by using canned or boxed beans. Just combine the beans with the vegetables in step 2 (and some fluid: water, vegetable broth, or tomato sauce), cook, then continue with step 3. This is thanks to Robert. It started out as baked beans made with kidney beans but at the last minute (ok, hour) I turned it into chili. This entry was posted in Uncategorized on January 1, 2019 by Bix. Wow! This sounds great! I love chili! I like it hot but not too hot. I’ve made it with jalapenos and … ouch! The next time I make it I’m going to add some frozen corn kernels towards the end. This looks good. I’m going to plan to make it this weekend. Happy New Year! I’ve always soaked beans but will try not doing so, allowing sufficient time. But the main thing of interest here, to me, is the way you are adding corn flour to this and previous bean recipe. Great idea and am going to do it today.